Clues to lumbar pathology are found in all views: AP, Lateral, Obliques, and Flexion/extension views. The AP view may reveal scoliosis or spine mets. The scoliosis of adolescence is usually rightward in the thoracic spine (away from the heart), and leftward in the compensatory lumbar curve. 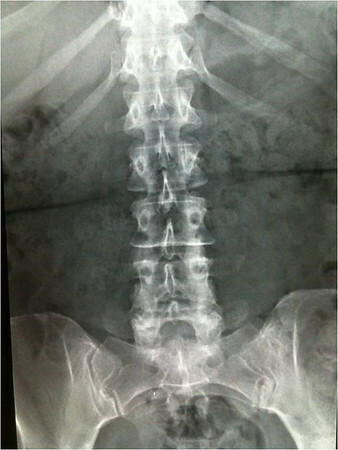 The lumbar scoliosis of the elderly, degenerative spine can be in either direction. Keep in mind that the convexity *opens* the neural foramen, and the concavity *narrows* the foramen. The concave part of the scoliosis can close the neural foramen and pinch the nerve. While looking at the AP, be sure to visualize the pedicles at every level. A “winking owl” sign may herald a destructive process like metastatic cancer in the pedicle. The lateral view may show fracture or subluxation. Each vertebra should be examined in the lateral view, looking for a compression fracture, often seen in the upper lumbar or lower thoracic, sometimes representing an old or occult fracture. 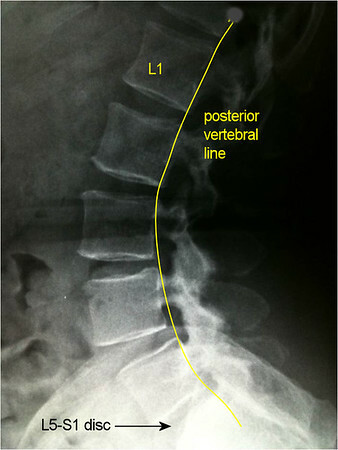 Next look at the posterior vertebral (marginal) line, looking for the subluxation of spondylolisthesis, most often occurring at L4-5, but possible at any level. The x-rays, of course, do not image the discs, but you can make inferences about the disc based on the space between the vertebrae. L4-5 should be the tallest disc, with L3-4 and L5-S1 tied for second place. Loss of disc height is radiographic evidence of disc degeneration. 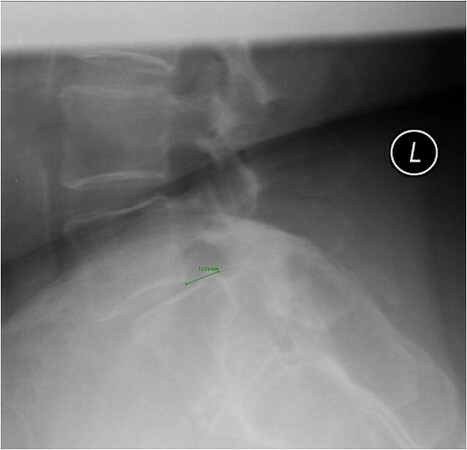 The oblique view is useful for one finding only: Pars fracture (defect). 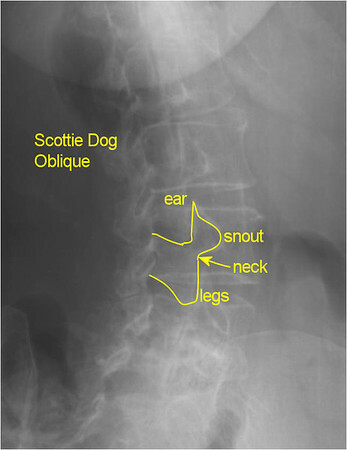 If there is a defect of the pars interarticularis, it may be imaged on the oblique view, and will appear as a Scottie Dog sign. At each vertebra, look for the Scottie Dog. If the Scottie Dog has a “broken neck,” you are looking at a fractured pars interarticularis. 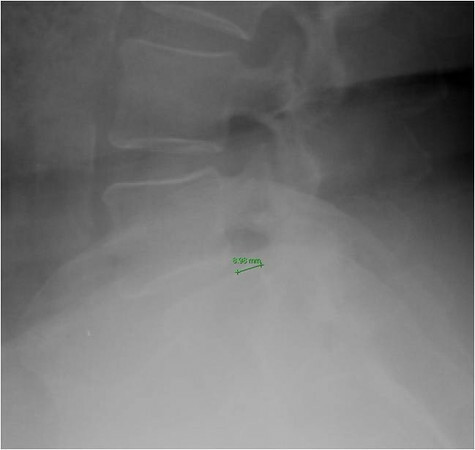 If a spondylolisthesis is present, you may see anterior displacement of one vertebra upon another. In an unstable, mobile, spondylolisthesis, the “slip” will be greater in flexion, and less on extension. In other words, the “slip” may reduce on extension. In any case, a mobile spondylolistheis can cause severe mechanical back pain, with leg pain if a nerve is pinched in the intervertebral foramen. 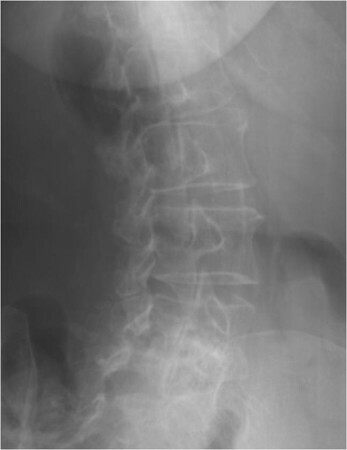 Order plain lumbar radiographs to evaluate back pain and trauma. They yield great information about the vertebrae and spinal configuration. short and very beautifully explained. Once these points are included in the report we will not miss any major finding. oblique x-rays are not upto the mark. Should include the HEDIS guidelines, that below age 55, no sciatic signs, no malignancy red flags, lumbar X-rays are generally inaccurate if pain is the primary symptom. Young residents can barely read radiographs these days, there’s so much to learn from them.